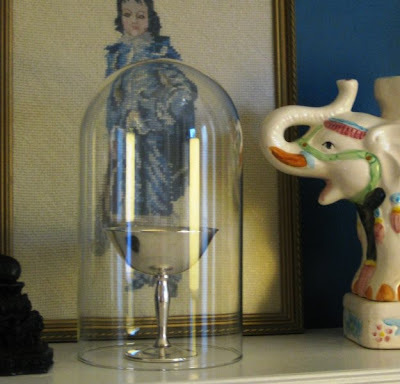 Remember this post here when I was looking for a glass dome- well a little trip over to the Goodwill this weekend and I came home with my very own glass dome- woohoo!! It doesn't fit the black Buddha like I wanted it to, but since it was seriously so cheap I cant be picky. It is, however, covering the new silver plate trophy I picked up also- its says " '74 Doubles Championship"- Its probably not going to stay there but for photo purposes I had to put something under the dome. Oh great find! Happy to report I'm back in action and still drooling over that sweet elephant you have. This is such a great find and I'm sure it was a lot cheaper than the ones I saw a Home Goods for $9. I'm loving the blue paint, can't wait to see how it all turned out. I've been looking for one too. I always find the short stubby ones that don't work with what I want to use it for! Good find girlie! Okay, I totally see your new paint color lurking behind the wall. Post photos please because I have no idea that it's going to look AMAZING!! !